We are a leading Manufacturer of yellow corn flour, corn flour super fine quality and corn flour powder from Ahmedabad, India. We deliver fine quality corn flour for various applications. It is made from Milling de-hulled yellow corn kernels. It is a finer grind than corn meal. It is a key ingredient for manufacturing corn bread, muffins and other bakery products. It is used as a wheat flour substitute for manufacturing Gluten free products. 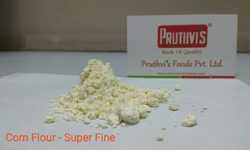 We deliver Super fine quality corn flour for various applications. It is made from Milling de-hulled yellow corn kernels. It is a Super fine quality for a smooth finish of your end product. It is a key ingredient for manufacturing corn bread, muffins and other bakery products. It is used as a wheat flour substitute for manufacturing Gluten free products. 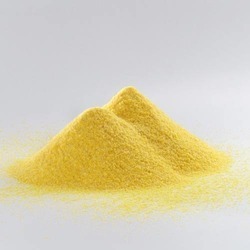 Corn Flour Powder is usually a fine Yellow powder with a yellowish tinge. It is made from Corn or Maize and is primarily used as a thickening agent. It is easy to use, tasteless and contains no wheat or gluten. Corn flour blends to a smooth cream or slurry when combined with cold liquid. It, therefore, cuts the need for fats when used to make sauces and eliminates the hazard of lumps forming. Because it is tasteless, it can be used in delicate sauces and recipes which call for a thickening agent. In the making cakes and other bakery products. In certain desserts, puddings and fruit pie fillings. It is blended with wheat flour for preparing yeasted bread. In Mexican dishes for making tortillas, tamales, and dumplings. Looking for Corn Flour ?